Are you wasting your most powerful marketing weapon? Forget the classifieds, the billboards, the radio ads and even the banner exchanges. For sheer affordability (maybe 2 cents each) and versatility, you can’t beat the humble business card. You probably ordered some as soon as you started your business. It was thrilling to see that fresh-printed symbol of business legitimacy, wasn’t it? Nothing says “I’m in business” like owning business cards. Unfortunately, the “real world” soon intruded, and you probably discovered that not everyone was as eager to GET your card as you were to GIVE it. You may not even be using your cards much anymore. Truth is, it’s TOUGH to design an attention-getting card, find just the right way to give it to prospects, and then organize all those cards you collect. It takes some knowledge, and it takes some practice. But believe me, it’s worth it. Business cards are portable, versatile, readily accepted worldwide, and so cheap you can’t afford NOT to use them! Add a photo if you’re in a “relationship” business (such as real estate, counseling, or law). This is also helpful if you do business in other countries, where your gender may not be apparent from your first name. 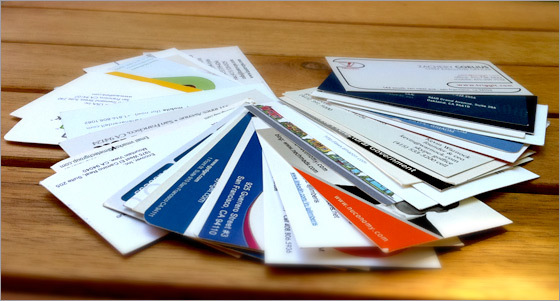 Did you know that business cards with photos are less likely to be thrown away, and more likely to be placed on top of any pile of cards? Use color wisely. Some blues, browns, and oranges don’t fax or copy well; ditto for dark colored cards and those printed on super-bright stock. An inexpensive way to liven up your card is to use colored ink on colored stock – try burgundy ink on ivory or gray stock, or brown ink on beige stock. Print on both sides of the card. Add company hours, product benefits, a map to your store, a discount coupon, or such useful information as a table of weights and measures or calendar. If you can’t seem to find a suitable moment to give your card to someone you feel could be a great prospect, ask for his or her card. (In fact, ask for two or three. Tell them you want extras to distribute to people you know.) Odds are, they’ll ask for your card in return. Introduce yourself with your card. Hand your card to the receptionist at the doctor’s office, the hostess at the restaurant, or the technician at the auto repair shop. Refer business to others. Offer to include the cards of business people you respect with your mailings, if they’ll agree to do the same with yours. Join a business-networking group. Rate prospects “A”, “B” or “C”, with “A” being a hot prospect and “C” a lukewarm lead. Write the rating on the back of their card. Develop a system for carrying and collecting business cards, and file them the way you remember them (by company name, person’s name, or industry.) A cigarette case or coin purse with compartments can be used to temporarily organize business cards. If you have time, enter the business card into your contact management system. You can also use a number of apps for smartphones and tablet computers that allow you to scan business cards and store them efficiently. Find a program that allow you to make notes about the contact. Set yourself a goal of giving out 5 or 10 cards daily, and very soon, you’ll be getting the attention (and the money!) you wanted. And that’s why you went into business, right?